The first ten days of the campaign are gone and the next goals are very close: just a few people are missing to reach the 400% of the funding, an outstanding target! We can't wait to show you the next Stretch Goal to be revealed. And when we say “we can't wait” we mean it literally! 😀 As a preview of our path for the next days, here it is the Stretch Goal planned for 90.000 euro: the official set of Lex Arcana Dice. It's a complete set of NINE dice: 1d3, 1d4, 1d5, 2d6, 1d8, 1d10, 1d12 and 1d20: all you need to play your adventures in the Empire Without End. As you can read in our Quickstarter Set, the Virtutes and Peritae defining the Custodes, as well as their weapons and armour, are recorded on a character sheet as a numerical value. Whenever the gameplay calls for a die roll, for example, to adjudicate the outcome of an action, the players roll a dice combination corresponding to the appropriate Attribute value. The sum of the maximum number of the die/dice to roll should be exactly that value. For example, if the Attribute value is 8, player can roll 1d8, 2d4 or 1d3+1d5; if the value is 12, player can roll 1d12, 2d6, 3d4 or any other 1-3 dice combination. The dice allowed in these rolls are the ones in the official set: d3, d4, d5, d6, d8, d10, d12, and d20. A complete set of this eight dice (+ another 1d6) will be included in every Demiurge Senior Pledge, and also available as an ADD-ON! 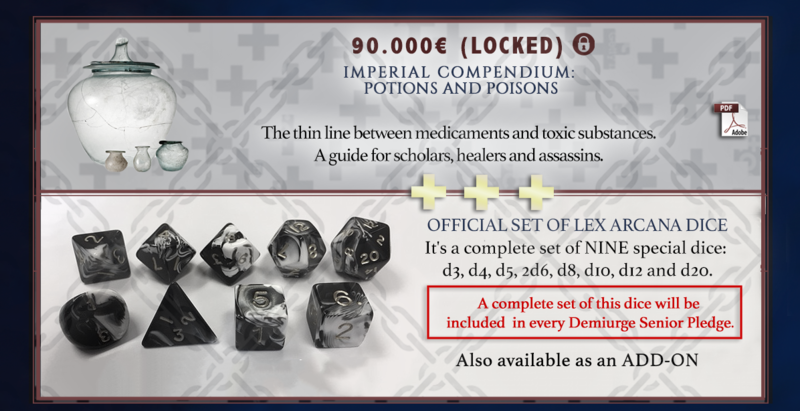 The same Stretch Goal (90.000 euro) also offers a new Game Addendum with PDF Logo: Potions and poisons in the Empire, a guide for scholars, healers, and assassins. Help us to spread the word and enlist other Custodes, to make this possible for everyone. We have a number of other surprises after this one!